Several producers of the official Boston Marathon movie have told me that Bill Rodgers and I play a significant part in their film. I’ve also been told that I say some funny stuff. This makes me nervous. Don't get me wrong. I'm sure the movie will be the best ever on marathon races. 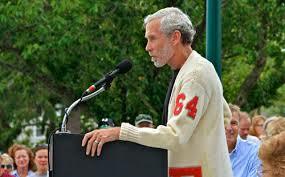 Director Jon Dunham has previously done outstanding feature films about the Chicago Marathon and the Rome Marathon. And unofficial Boston Marathon historian Tom Derderian is executive producer; he'll make sure all the facts line up right. The movie opens Saturday evening in Boston at a sold-out premier, and then around the country on one night only, Wed, April 19. See here for a theater near you. My concern is this: Funny? Funny is close cousin to silly and stupid. I hope I don't say or do anything dumb in the movie. First, the good news. You won’t be subjected to my lame attempts at Argentine tango dancing with my wife. Cristina moves like a goddess. Me, not so much. Director Dunham dutifully followed us to our lesson, and filmed my robotic tango. But he had the good sense to cut the footage. Same for my explanation of the muesli-like concoction I often prepare for breakfast. “I start with oatmeal, add a lot of nuts, seed, and raisins, and top with allspice and a light stream of maple syrup.” Jon filmed the entire step-by-step process, but I could tell I was no Swedish Chef, Julia Child, or Mario Batali. The truth is, I know almost nothing about the movie. Those in charge have been as secretive as magazine editors who keep their next issue under wraps. I know that world. Fine with me. But here’s where I'm secretly hoping to see myself in the film. Dunham filmed Rodgers and me running up and down the Boston Marathon’s infamous Newton hills and standing beside the double statue of “Old John” A. Kelley (as a young runner, and later a veteran.) History, tradition, and “passing the torch” are important to gnarly New England roadies like me and Bill. For a half-century, Old John was the most famous runner in the Boston Marathon, no matter what the year or who the ultimate winner. I don’t remember what Bill and I said about him, but I’m sure it conveyed our deep respect. His story deserves to be retold, and his memory honored. 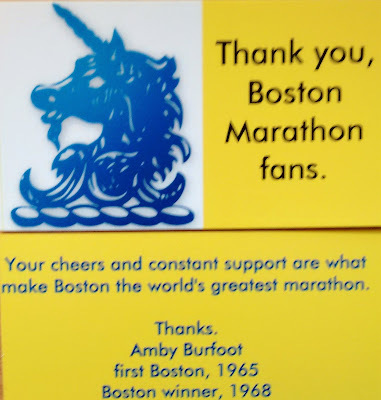 I feel an even stronger personal connection to “Young John” Kelley, my high-school coach and 1957 Boston Marathon winner (the only member of the BAA running club ever to win the BAA Boston Marathon). It would be nice to see a clip from the Kelley statue dedication in downtown Mystic, Connecticut. I wore my high-school letter sweater that day to recall my early link to Kelley, and noted that he would have laughed heartily at the statue’s location next to the famous Mystic Pizza shop. 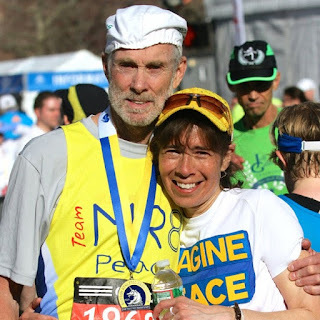 I ran the 2014 Boston, and the two since then, for the Martin Richard Foundation and Martin’s lasting message: “No more hurting people.” Cristina, a big John Lennon fan, ran with a t-shirt saying: “Imagine peace.” The picture of us together just beyond the finish line is one of my favorites. I wonder if that photo found its way into the movie? If I made a funny remark on camera, it was probably about the time Cristina called my cell phone while I was still on the Boston course. I like to quip, “Like any red-blooded American male, I rarely do what my wife tells me.” This time was different. I had just reached an unexpected roadblock at the 25 mile mark. Yes, it was 2013. “There have been some explosions at the finish line,” Cristina said. “Don’t you dare keep running. Walk back to the hotel.” I had never heard such urgency in her voice, and I followed every syllable of her instructions. I give them that and a little more. The Boston Marathon is a great New England tradition, and the best and biggest piece of all is the multiple generations of roadside fans. I figure it’s never too soon to encourage the youngest among them. They’re the Boston Marathon runners, and supporters, of tomorrow. Let's keep 'em coming.